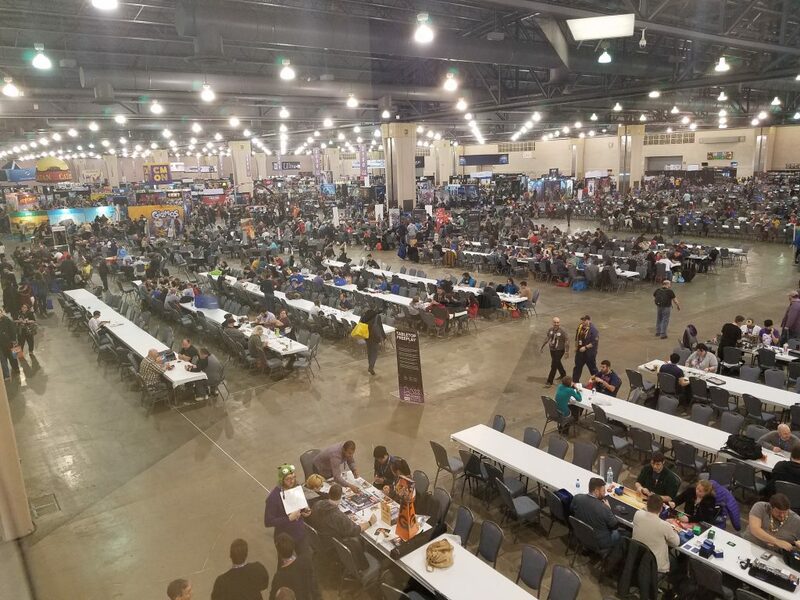 I turned 29 during last month’s delightful PAX Unplugged, and I think this is the year where time really starts to accelerate, because it’s been an absolute blur since then. Even PAX felt like it was over too quickly. I guess from here on out it’s a downward slide of rapidly accelerating time. In other news, PAX Unplugged was super fun! I over-committed to too many things last year, so this year I tried to keep it chill. I was successful at that and got to play some fun games and talk to cool people. 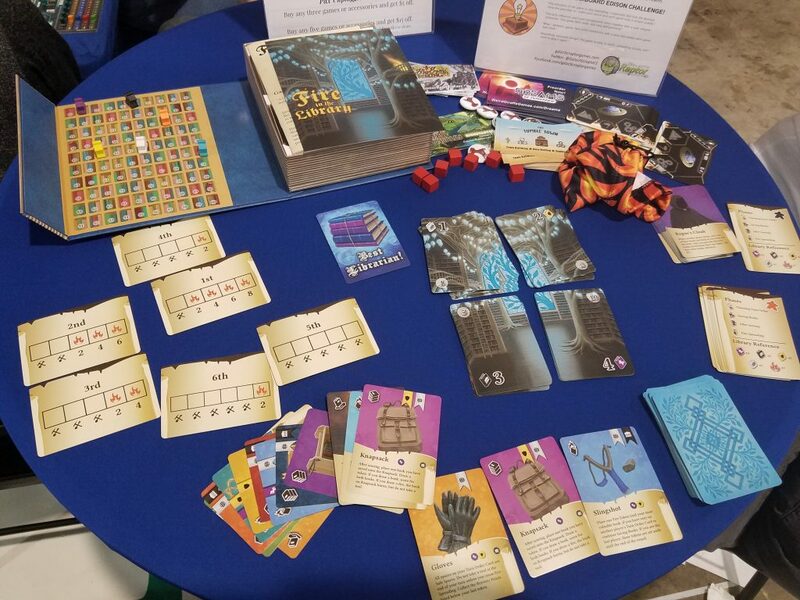 Amber and I already spoke about many of the games we played at the convention, but in this post and the next I’ll go into more detail about the games I happened to see on the expo floor and the games I arranged beforehand to demo and discuss. Let’s begin! I realized soon on that I didn’t have very much scheduled for Friday, so I decided to do a couple of tournaments. The first was Keyforge, which I had just gotten in the mail a few days before. I know the rules well enough, and I figured this would be a good way to get a couple of new decks and see what kind of strategies more devoted people were using. Unfortunately, each of the three people I played were as inexperienced as I was. Nevertheless all three rounds were enjoyable, and I even won once. I also discovered that I am an exceptionally poor judge of Keyforge deck power. Bonus: 2 time Netrunner world champion Dan D’Argenio was in the same tournament. He was wearing sleeves, and it looked weird. No, I didn’t say hello. Who do you think I am? The prize pool was lackluster at best, which actually might be an issue with Keyforge’s long-term chances. I’m not entirely sure about other card games, but at least with Netrunner some of the most sought-after prizes were alt-art cards, and that’s not possible at all with Keyforge. You could still give away playmats, though those are more expensive so they’re suitable for only the higher-tier rewards. At this tournament, everyone got a resin key piece for each win, and I’m not sure if there was anything beyond that. I guess it’s something, though it looks sort of ugly and doesn’t lay flat when upside down (which is how it’ll need to be for a good chunk of any game). But I’d need to collect three of these to actually use a full set in a game, and six if I want a set for each side. It’s incomplete, and sits there like a weird looking paperweight on my desk. I assume at some point I’ll throw it in a box and forget about it. Maybe I’m being so harsh because I’m not enthused with Keyforge as a game. 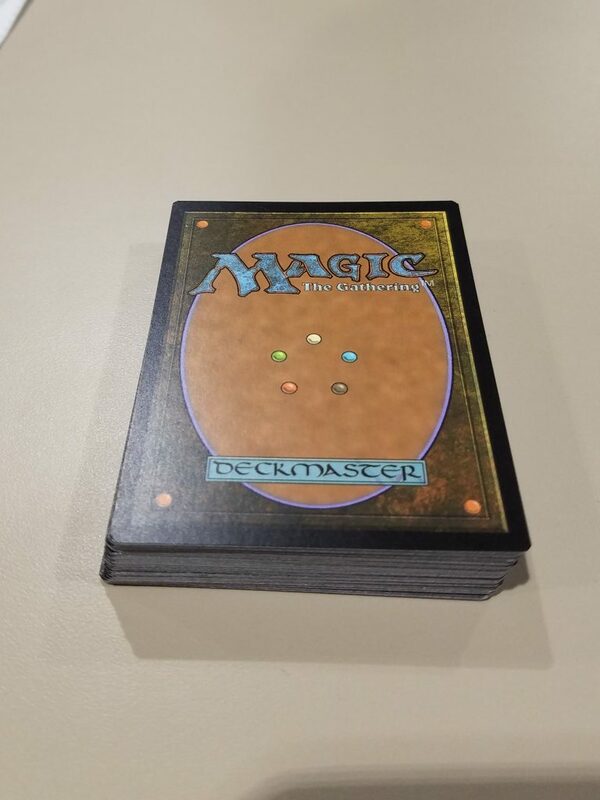 The deck collecting is addicting, and that scares me. The gameplay often feels like it relies far too much on getting useful cards without much you can do to change that. You never quite feel like you’ve done anything particularly clever, though some of the interactions can be amusing. I need to give it some more time, but I don’t know if I’ll be putting any more money into it. Frankly, if they’re going to call it a chaos draft, there ought to be more chaos. I guess we did have some “un” packs from the tournament-illegal joke sets, although those cards tended to be either really dependent on other cards from that set or not that insane (the best I saw were a couple “roll a die and see what happens” cards and one that required asking someone if they’re a fan of squirrels). That said, I had just started playing MtG Arena before PAX and had that magic buzz, so I was quite excited to sign up for this event with a couple of friends. They’re veterans, and I got seated at a table much further away, which was unfortunate because my plan was to have them around in case I committed some kind of horrible MtG faux pas to bail me out. Instead I went with an alternate strategy, one involving me signaling to my randomly selected draft herd that I was dumb and inexperienced, in the hopes that they’d leave me alone. Another rookie! The guy across the table and one space to the left, who is literally getting his sleeves prepped out of his super fancy deck box that looks more like an origami spectacle than a box, mutters a stolid, “yep”. The social ritual was a success, and soon two others engaged in conversation signaling that they too were not competitive regulars. I got a rad looking dragon on my second pick, locking me into black/red/green, which are colors I like anyway. My first opponent took his cards and ran, giving me a forfeit victory. That put me at a high table, where I promptly had horrible draws and lost, before a very fun third match I managed to squeeze a victory out of. I never got to cast that dragon, though. I had a plan for the expo hall this year. Instead of wandering semi-aimlessly, allowing the sights to wash over me like a consumerist fog of malaise, I started at the far wall and decided to progress in a logical fashion, one row at a time. This did not help the consumerist fog of malaise. 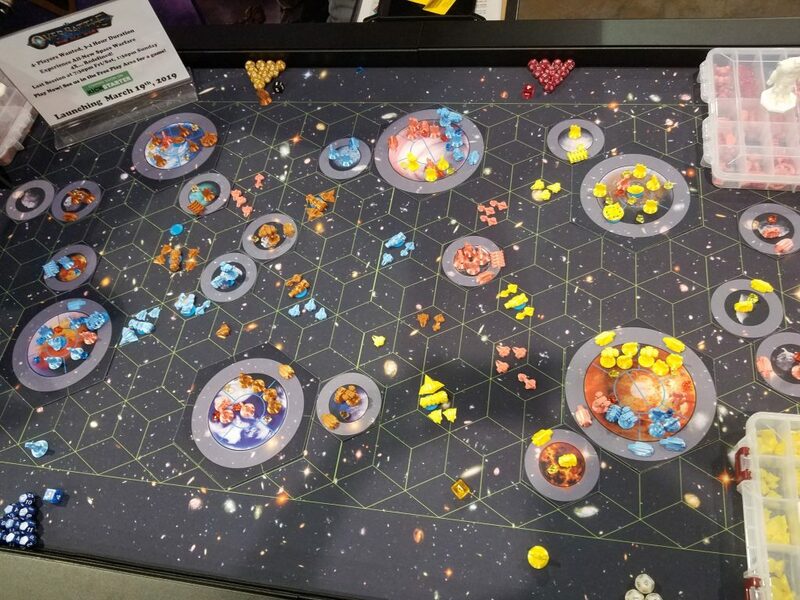 The very first thing I saw was a table covered in an elaborate hexagonal playmat with all kinds of sci-fi ships and planets and stuff populating it. As I gawked, the designer started into his spiel, which is usually when I start awkwardly creeping away, but his ideas of how to take an epic war game like this and cure it of many of the flaws of the genre were actually pretty good. So I asked a couple of questions and snapped a picture of OverBattle before moving on. Professional that I am, I don’t remember the details at all. This was another game I stumbled upon whilst wandering. I had forgotten that Weird Giraffe Games would even be at PAX, and I was excited to see some of their new games. I got an explanation of Fire In The Library, which is an absolutely beautiful press-your-luck game. I don’t think it would necessarily be a great experience, but probably a solid game. The art really is spectacular, though, and it might be worth checking out just for that. I think there was an early copy of Animal Kingdoms there too, though I didn’t get a close look due to the booth being so busy. That just went up on Kickstarter a couple of days ago, and it again looks wonderful. It’s also already won an award from Cardboard Edison. Weird Giraffe is really stepping up their game. You may remember my first impressions of Stellar Leap, which were not…stellar, but these new releases are showing an entirely new level of polish that is certainly attractive. It seems like Carla Kopp is taking a very Stonemaier-esque approach by maximizing production values as much as possible and having a very specific brand in terms of which kinds of games she’ll publish. I arrived at my scheduled meeting time to find the Kosmos booth busier than perhaps anticipated. The person I had scheduled the meeting with was not there–but no worries, because a guy whose name I just realized I should have written down was there to talk about their game lineup, and his enthusiasm was infectious. I only know Kosmos as that one German publisher that publishes every single light/mid-weight German game you’ve ever heard of. To wit: their BGG page lists nearly 900 published games. I didn’t know quite what I was expecting from them, but they were advertising Ingenious, and I knew that I wanted to cover both abstract games and Reiner Knizia designs in 2019, so I agreed. I got a fantastic rundown of every game they were showing from nameless enthusiastic man (sorry! ), and I was actually very impressed. 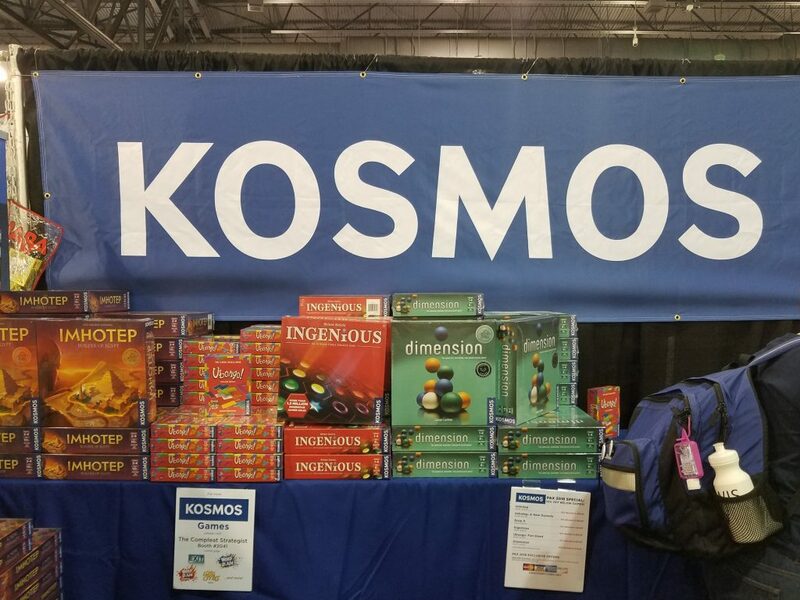 Kosmos has a lot of family-oriented affair, and while I don’t cover those kinds of games a lot, I do love finding a gem in the genre. There might be a couple of those among this bunch. First I got a quick rundown of the new version of Ubongo, which is a board game version of a tetris-style “fill in this unique shape” puzzle. The new version is called the “fun size”, which means that it retails for $15 and fits in a small box. Earlier versions had a die rolling mechanism which has been replaced by a card system to determine which pieces you have available. To be honest, this is the game out of the entire bunch that I’m least interested in. It’s probably not bad, but this kind of puzzle doesn’t inspire a ton of excitement for me. 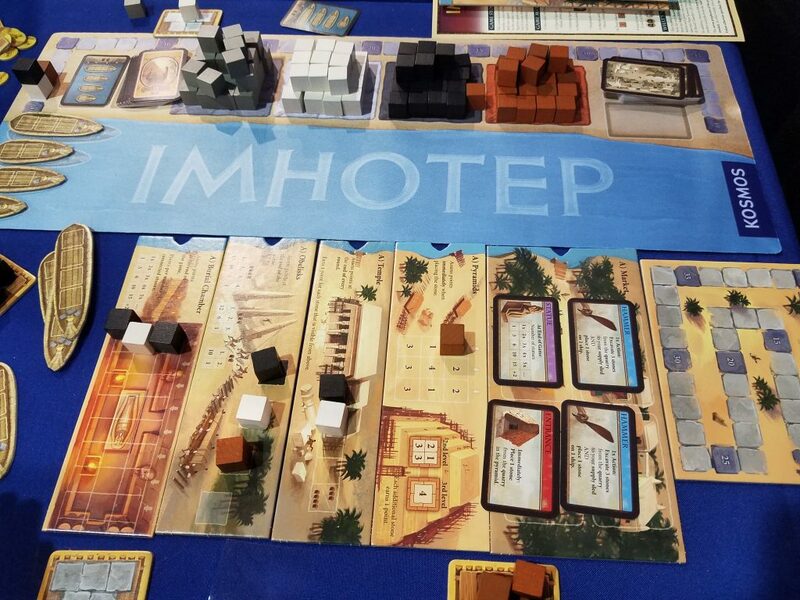 Next we looked at Imhotep, the Spiel-nominated, Egyptian-themed euro from a couple of years ago. The demo copy was blinged out with an expansion and con-exclusive playmat that looked very nice. I mean, as nice as this game can be with its various shades of grey and brown. It’s not a bad looking game, but like the theme it’s light as a feather and more about the mechanisms. The base game involves adding blocks to ships and then sending those boats to different stations that have a variety of different geometrical set collection incentives. There’s a good amount of indirect interaction, because which boat you put blocks on is your choice, but everyone can send a boat to a particular port, so you don’t have complete control over their ultimate destination. The expansion, from my novice eyes, seems to significantly improve the game through sheer iteration. 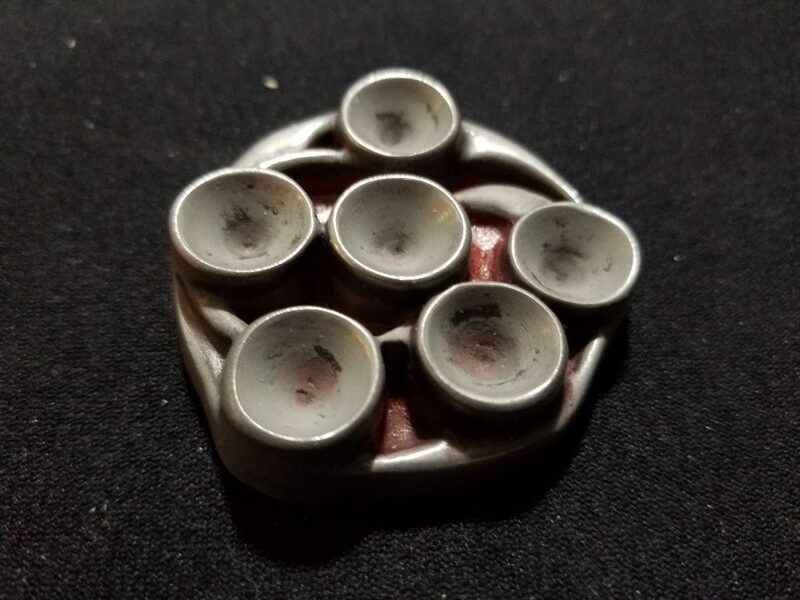 Certainly the base Imhotep was perfectly suited for that Spiel nomination, but as a family game prize, some of the winners don’t necessarily hold continued interest for hobbyist gamers. I’d point to Kingdomino and Colt Express as recent examples. Imhotep: A New Dynasty adds 2 new options for each port area which utilize fun new components; one’s a chariot race and another builds scaffolding. The coolest addition are the prophecy cards, which give you points if you achieve certain accomplishments, but instead of being distributed at the beginning of the game, these cards are gained through in-game actions and give you points based on when you take the prophecy (because it’s a lot easier to accomplish a prophecy if it’s nearly complete at the point of prophesying). It’s that kind of gamey addition that I think will bring new life to Imhotep for those who have played out the base game. Dimension is another real time puzzle game, but this one is played by stacking spheres into a pyramid shape. This one seems a hair more complex than Ubongo, as there are a number of logic rules you’re trying to follow as you stack your spheres, as well as some other point-gaining bonus goals. The Kosmos rep got very excited about Dimension, saying, “you have to balance trying to get as many spheres out as you can while following as many rules as you can, while also getting at least one of each color out.” The 3D visual aspect is neat, and I can see this being more of a challenge for the parents in a family game night situation with a wide age range. Speaking of games with an impressive visual impact, Drop It looks far more fun than it has any right to be. Remember as a kid, when you were excited to play connect 4 because you got to drop pieces down the slots in the vertical game area, and the cool sound it made when you released all of the plastic bits from their plastic cage? Also remember how the game itself was sort of sad? Drop It is like the antidote to that mixed childhood experience. 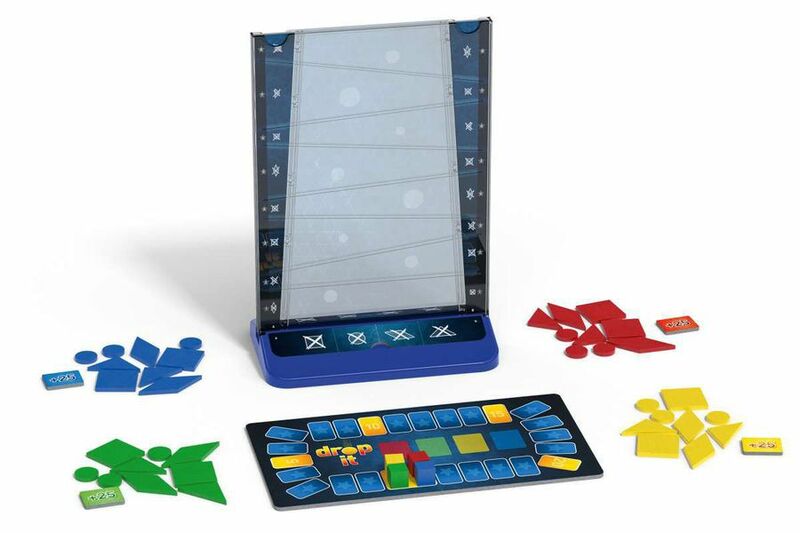 Instead of a solved, dull abstract game, you’ve got a collection of shapes in different colors, and you’re trying to drop them in the clear enclosure so that similar shapes and colors never touch. You’re also trying to stack your pieces up as high as possible to hit higher-scoring areas. Drop It looks incredible, and I absolutely love the idea of manipulating a bunch of shapes freeform as you push your skills as much as possible. There were a couple of people playing as we discussed it, and at one point they had to get on their knees to inspect a particular drop. It appeared to be touching a piece of the same shape but in fact was sitting above it by about half a millimeter. Drop It is made for those kinds of tense moments. Of all the games we talked about, this was the one my new Kosmos friend was most enthused about. Perhaps in an attempt to keep me interested in his pitches, he lead with, “my friends and I are serious gamers and we play this all the time.” I don’t doubt it. Not one bit. I first stumbled upon Sumer more or less at random while wandering around PAX East. I think it was the indie showcase, and I was enjoying myself trying out all 2 of the games that weren’t difficult 2d platformers when I did a double-take at Sumer. At first glance it seemed to be in that oversaturated genre, but it was multiplayer, and people seemed to be gathering wheat and there were no enemies on screen. I know what that is–it’s a eurogame! Flash forward to PAX Unplugged and I got to speak with Misha Favorov, one of the designers of this mid-level digital euro. That was the main goal throughout the project, according to Favorov: “We set out to make a worker placement game. A classic euro-style board game”. The twist is that Sumer utilizes its digital nature to put a twist on worker placement. Instead of using a turn order mechanism to determine who gets first pick, everything is real time. All players are on screen and they literally race to get to the spots they want. I don’t quite remember how well this worked out in the demo I played at PAX East, but the idea is very intriguing at the very least. When asked about the biggest challenges, Favorov spoke about teaching players how to play the game. While it’s fairly simple to guide people through a demo at a con, if someone picks up the game on Steam they’ve got to figure out the mechanisms without becoming frustrated. Normal board games have a rulebook, but that’s not feasible nor expected in a digital game and is sub-optimal anyways. Originally they wanted to have a robust tutorial system where the game teaches players step by step as they play, but they realized that even that wasn’t particularly engaging, and players found it to be a disadvantage due to the real time elements. Ultimately the best move was to dive deep into UI and graphic design to reduce the need for tutorial elements. I’ve got to say that the game looks pretty good, with tried but true eurogame elements and a pleasant visual design. I admire their singular focus to really stay with classic euro principles and not make the game too video gamey. It’s a niche, but one I’d like to see explored further. When I find the time I think I’ll get myself a copy and dive into Sumer’s gameplay. It’s available on Steam and the Switch for $15. 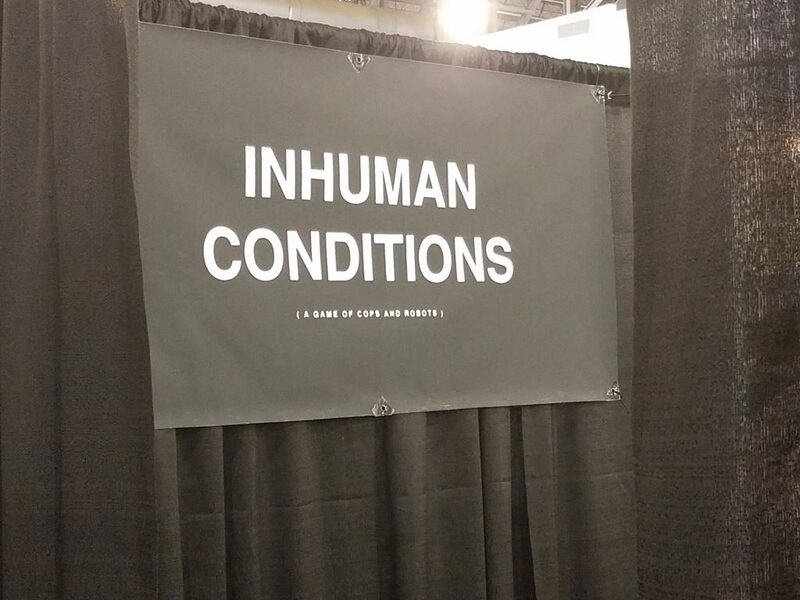 Finally we get to one of the highlights of the expo hall, a little 2-player social deduction game called Inhuman Conditions. Borrowing liberally from the Voight-Kampff test from Blade Runner, Inhuman Conditions pits an investigator against a possible robot. Over the course of five minutes the investigator will prod the suspect with questions, trying to figure out if they’re answering in line with certain secret robot behavior parameters, or if they’re just a normal person. My demo was tense, and I failed as the investigator. It’s an odd duck of a game, and I’m not quite sure how much replayability there will be once you’re familiar with the robot prompt cards, but I think it’ll succeed, at the very least, as a novelty party game. Even though it’s strictly 2-player, it’s an excellent spectator event and I can see groups spending their entire evening playing through this game over and over. If my long-term replayability fears are unfounded, this could be one of the most unique and exciting games of 2019. I’m crossing my fingers. Stay tuned for part 2 of my PAX Unplugged recap, where I’ll talk about another party game, an RPG, and everything that AEG’s got up its sleeves. Thanks Marc for stopping by the Syther Gaming booth and taking a peak at “OverBattle: The All War” at PAX South! Of course! I now wish I had spent a bit more time with it, because looking back it did seem quite interesting.